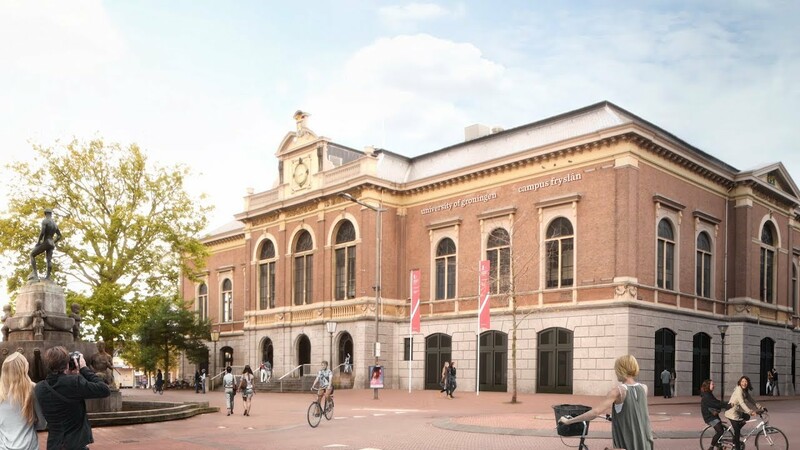 On Saturday 2 June interested parties could take a peek inside the 'Beursgebouw' (former Trade Building) in Leeuwarden, which is currently being thoroughly restaurated for RUG / Campus Fryslân by Bouwgroep Dijkstra Draisma. As many as 1712 visitors visited the monumental building in the heart of Leeuwarden, which among other things is being made more sustainable. For young and old, there were fun activities in the Beursgebouw. How are 360 ​​degree photographs applied in the construction industry? And how well can you make design drawings using 3D models? Or use drones for inspections? Visitors could view and experience all the tools themselves. And the smallest visitors could not finish their fun with the inflatable bouncers and the drawing contest. In short, a successful Day of Construction 2018. The Day of Construction is organized by Bouwgroep Dijkstra Draisma together with the project partners, who all had their own stand in the Beursgebouw. Besides the University of Groningen and J.O.N.G. architects, are Euro Funders, Visser Konstruktiebedrijf, plasterer company De Alde Stjelp and installer ITBB. The national monument was designed as an trade building in 1880 by the famous city architect Thomas Romein. In recent decades it has been used as a central library. Now it is being converted into a faculty building for RUG / Campus Fryslân, which will soon accommodate some 1,000 students and staff. In addition to creating good education and research facilities, there is plenty of attention for making the building more sustainable. Thanks to improved insulation and solar panels, we make the building gasless. This is how Leeuwarden will get the first monumental, all electric education building in the Netherlands. Naturally, the historical character is retained. Knowing more? Look at www.rug.nl/CF. Last modified: 19 December 2018 07.01 a.m.